The Old Dairy review – fresh curds or sour milk? 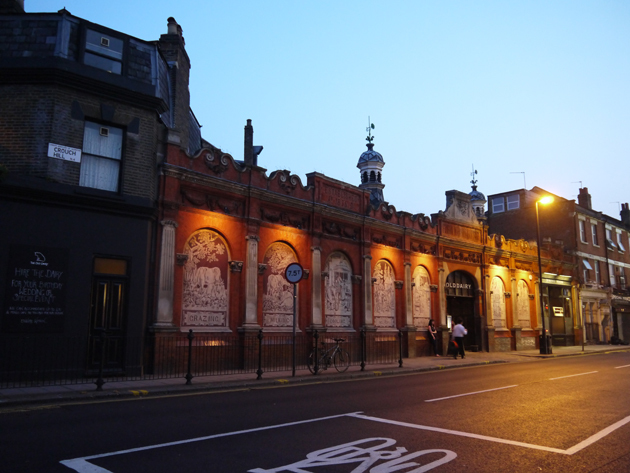 As its name suggests The Old Dairy is situated in what used to be an old cow juicing facility dating from 1890. Situated on the same stretch of grey, unloved north London road as Chez Liline, its drab location makes its physical appearance all the more striking. 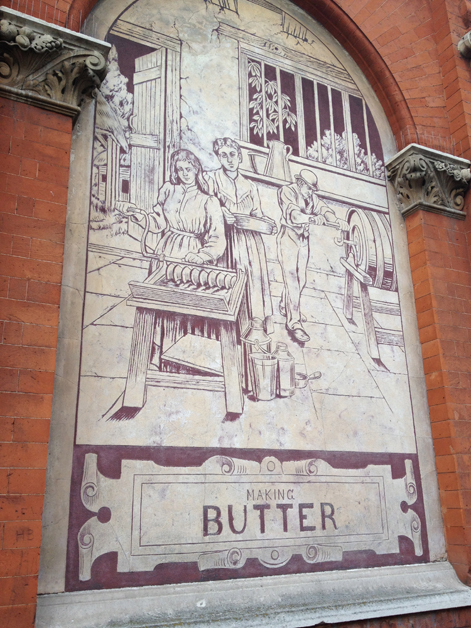 The handsome brick and wood exterior is decorated with some charming friezes of dairy/rural life. The interior is cavernous with lots of exposed brick walls, timber supports and quirky lighting from chintzy lampshades to chandeliers. Service was friendly and charming, but with only one or two servers managing a few dozen covers, getting someone’s attention was more of a hassle than it should’ve been. As a teetotaler I can’t comment on the booze selection at this gastropub, but I have plenty to say about the food. My first meal at The Old Dairy reflected the mish-mash nature of the menu. 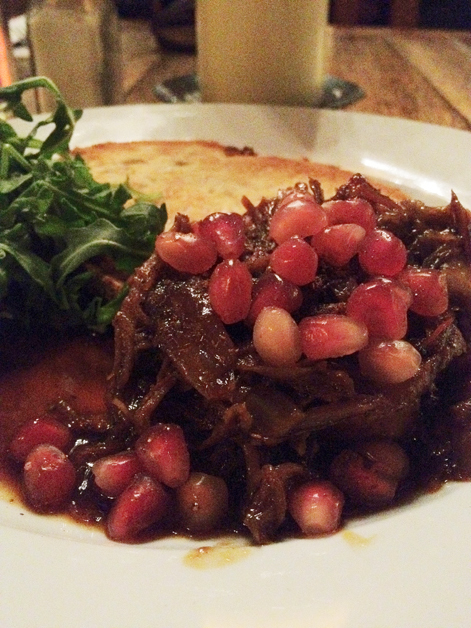 I started off with lamb shoulder served on toast with pomegranate. The dense, tender strands of meat were pleasing and served in a thick, stocky, bold and peppery sauce on a slab of chewy toast. The pomegranate was crunchy and slightly sweet, but the fruit and meat seemed ill-matched, neither complimenting nor contrasting with each other. When in doubt, chuck some rocket onto the plate for no apparent reason. 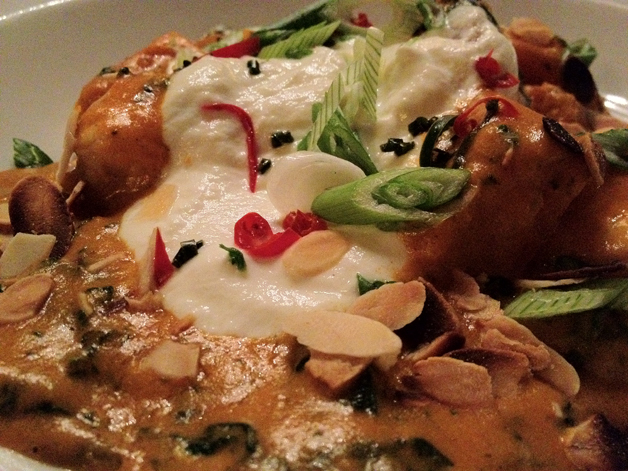 Of all the varied, eclectic dishes on the menu the monkfish and pumpkin masala immediately jumped out at me. The fresh chunks of monkfish were firm and supple, while the tender, sweet pumpkin and crisp slices of toasted almond added variation in both taste and texture. Unfortunately, the delicate flavours of all these components were all but blasted away by the overpoweringly creamy, tart and sickening sweetness of the masala sauce. The fragrant cardamom and coconut rice was only a small consolation. Bland food seems so much more enticing instead of this. 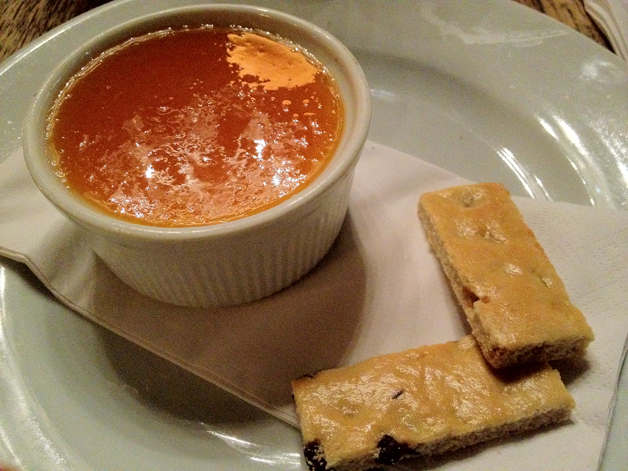 The most intriguing of the desserts was the Earl Grey cream tea pudding with orange syrup and garibaldi biscuits. I wasn’t a fan of the hard, bland biscuits, but I did enjoy the distinctive Earl Grey taste of the cream. Sadly this was washed out by the sickly sweetness of the orange syrup which formed an upper layer sitting on top of the Earl Grey cream. Tea. Earl Grey. Hot. To wash out the taste of this dessert from my mouth. My first meal at The Old Dairy started out reasonably well, but quickly went down hill. I was willing to give the place another chance though and I paid the pub a second visit a week later. Although the menu was largely the same, there were a few new additions which I plumped for, giving my dinner an ersatz Tex-Mex feel to it. I started off with the barbecue pork ribs. The meat wasn’t smoky at all but it was reasonably tender while the marinade was sweet with a fennel-esque hint to it. Unfortunately, little of that had actually soaked into the meat with most of the marinade coming off and sticking to my fingers instead which suggests a rather slap-dash preparation. The accompanying coleslaw was creamy, but not excessively so, with a subtle hint of smooth silky buttermilk to it and was comprised mostly of sharp, crisp red cabbage and onions. 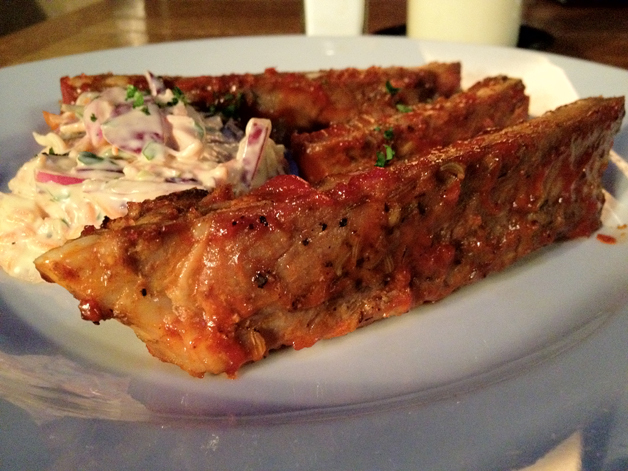 While the coleslaw was quite pleasing, it couldn’t make up for the disappointing, supermarket-level quality of the ribs. Soho Mexican restaurant La Bodega Negra has received wildly differing verdicts from several other writers. I can’t help but (mostly) like the place if only because it does a proper huevos rancheros, unlike The Old Dairy. 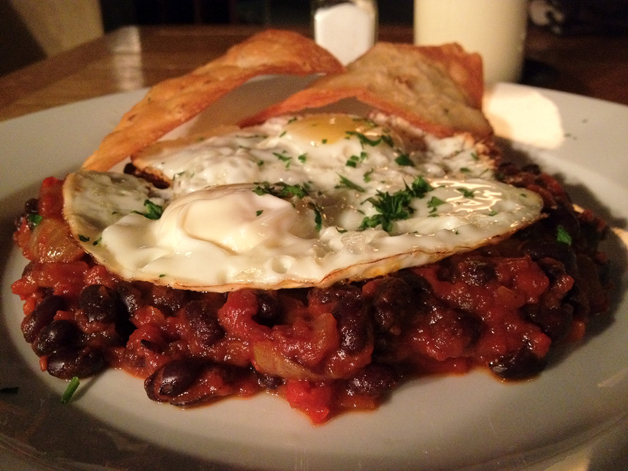 The huevos rancheros here was insultingly bad – so much so I’d have second thoughts about feeding it to an animal. The overdone eggs were solid instead of runny, while the squidgy kidney beans were served in a generic tomato and onion salsa which tasted little of either or, indeed, of anything at all. The tortillas, if they can be called that, were deep fried beyond recognition and the greasy triangles of stodge bore more of a resemblance to deep fried, overcooked samosa pastry than they did to tortillas. Vile. I was so repulsed by The Old Dairy’s sacrilegious version of huevos rancheros that I almost skipped dessert. 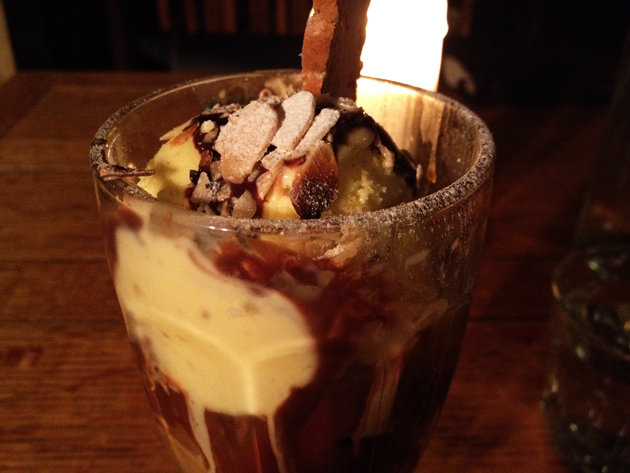 I decided to stick it out, but the flagship Old Dairy sundae wasn’t a rousing success either. The dulche de leche and vanilla ice creams were limply flavoured and the small scatterings of almond and buttery, but excessively hard biscotti didn’t impress either. The only joy to be had from this dessert was the viscous, intensely sweet butterscotch sauce and the dense, chewy, if characterless, mini brownies. To say that I was unimpressed by my meals at The Old Dairy would be massive understatement. Many of the dishes I had were unbalanced by an excessively strident component while others were just plain mediocre and the less said about the abysmal huevos rancheros the better. The Old Dairy may be popular with the locals, but they should really know better. Unless the kitchen undergoes a significant revamp, I would have to be very desperate indeed to eat here again. Reservations: not necessary on weekdays; probably a good idea on weekends. Total cost for one person including soft drinks: £30-35 approx. Tags: curry, huevos rancheros, ice cream, lamb, london, monkfish, old dairy, pomegranate, pudding, pumpkin, restaurant, review, ribs, sundae, syrup, toast. Bookmark the permalink.